SUMMARY: After an investigation by the Vatican, IVE founder Fr. Carlos Buela was forced to resign in 2010 as head of the IVE and to reside at a monastery due to “morally inappropriate behavior”. The sentence to a monastery is very harsh and usually reserved for extreme cases of sexual misbehavior, such as when Fr. Maciel was forced out of the Legion of Christ. The IVE have been lying about this for years and continue to lie: to their own priests, sisters, seminarians, donors, and prospective members. Fr. Carlos Buela, founder of the IVE, was ordered by the Vatican in 2010 to resign his position as head of the IVE and reside at a French monastery after investigations revealed "morally inappropriate behavior of Father Buela with several youths of the Institute." The revelations came to light via testimonies from IVE priests seeking dispensation to the laity. This is according to a leaked church document, shared below in its original form and followed by translations into Spanish and English at the end of this post. As we mentioned in a previous post, the circumstances of Buela's resignation in 2010 were never clear, in or outside of the IVE. Buela claimed his resignation was due to "poor health" - a dubious excuse given his active international travel schedule before and after the resignation. Inside the Institute it was whispered to be the result of "Church politics." There were rumors of something more material - and the IVE leadership surely knew the truth - but nothing was ever shared and the IVE repeatedly denied that this was due to abuse or that there was a punishment beyond his resignation as head of the Institute. Then, later in 2013, news leaked that Buela was to enter a Monastery Europe under order of the Vatican. Apparently, although he was persuaded to resign in 2010, he had not yet relented to the additional sentence of separation from the IVE and residency at a Monastery. Exactly how he was persuaded to finally obey his superiors is not clear and as outlined here his stay did not last long. What we do know is that around this time, little by little, more information trickled down to IVE priests from their leadership - anticipating rumors and the fact that Buela would no longer be conducting his worldwide visits to houses of formation. Yet to this day the whole story has never been shared with IVE priests, seminarians, nor any prospects of IVE's (or SSVM's) very active recruiting efforts. As evidenced by the IVE’s lying and cover-up of this information the last five years, this new revelation from the Vatican sheds light on much more than the just the problems of one man. Like the Legion of Christ, the defects of the founder are institutionalized in the groups he founded: the IVE & SSVM. These defects cause a very large and disproportionate percentage of IVE priests to leave the institute and ask for dispensation to the lay state. Ironically, it was through these testimonies that Buela’s behavior came to the attention of the Vatican. We will have much more commentary on the above soon, as well as more details on how many priests leave the IVE. For now we’ll leave you with the church documents and translations below. The First page of the original document is below. The full PDF is here. It is the function of the Congregation for Institutes of Consecrated Life and Societies of Apostolic Life to promote and regulate the practice of the evangelical counsels and to monitor the life of the Institutes with regards to their formation, religious discipline, apostolate, and government (cf. § 108 PB 1). Such institutional function of the Congregation is done in the name and by the authority of the Supreme Pontiff (can. 360) which has been widely and repeatedly informed about the case treated here and decided together. 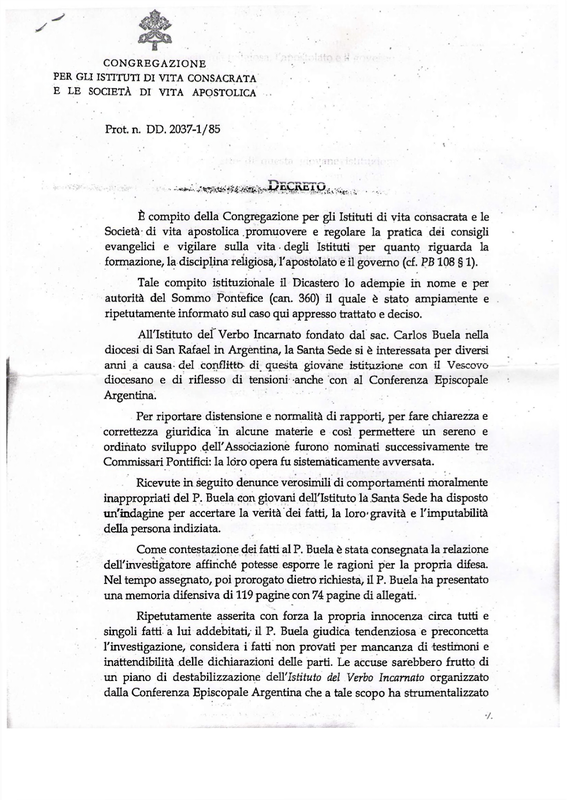 Regarding the Institute of the Incarnate Word founded by Carlos Buela, priest in the diocese of San Rafael, Argentina, the Holy See has been interested in it for several years because of the conflict of this young institution with the diocesan Bishop and tensions even with the Episcopal Conference of Argentina. In seeking to ease the situation, hoping to clarify and correct some canonical points and therefore allow a calm and orderly development of the Institute, three Papal Commissioners were successively appointed to no avail since their work was systematically rejected. 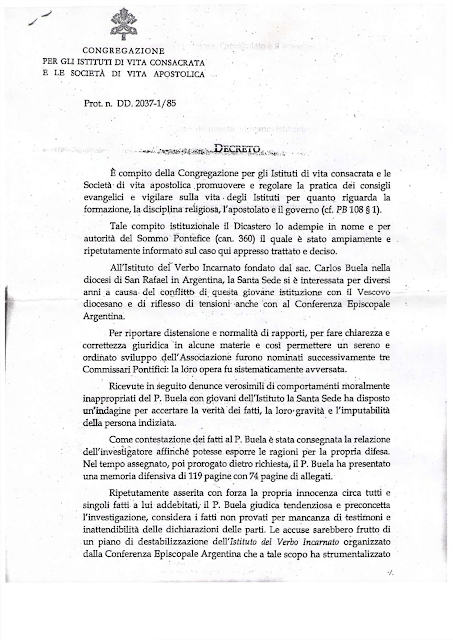 Subsequently, receiving credible allegations of morally inappropriate behavior of young Father Buela with several youths of the Institute, the Holy See ordered an investigation to ascertain the truth of the facts, their seriousness, and the accused’s responsibility. In response to the facts, Fr. Buela was given the opportunity to offer his own defense. In the allotted time, which was extended upon request, Fr. Buela presented a report in his own defense of 119 pages with 74 pages of attachments. With repeated forceful assurances of his own innocence with regard to each of the facts as related to him, Fr. Buela deemed the investigation biased and prejudiced, the facts unproven, a lack of evidence, and admissibility of the statements of the parties. The charges, according to Fr. Buela, were the result of a plan hatched by the Episcopal Conference of Argentina to destabilize the Institute of the Incarnate Word using those who had left the Institute and invented falsehoods against it’s Founder. 1. The insistence of a plan to destabilize the Institute of the Incarnate Word was found lacking any foundation whatsoever..
2. The testimonies are fully worthy of consideration not only by the quantity of witnesses and the logic and consistency of their statements, but also because a lot of them were in posession of further sources and more knowledge of the facts, since they were, or had been, members of the Institute of the Incarnate Word. 3. The truth of the facts is proven especially with the statements of the victims, according to what is provided in can. 1536 § 2, where we read: "In cases which concern the public good, however, a judicial confession, and declarations by the parties which are not confessions, can have a probative value that is to be weighed by the judge in association with the other circumstances of the case, but the force of full proof cannot be attributed to them unless there are other elements which wholly corroborate them." Other elements that should be considered in this case are the quantity and concurrence of the statements especially given the following circumstances: a) they were made tempore non suspecto, that is, when there was neither planned nor open an investigation against Fr. Buela. b) they were made while asking for dispensation to the lay state. It is, therefore, declarations and valued and taken as true by offices of the Holy See. c) The statements have not been recanted even when the witnesses have been informed of the investigation on Fr. Buela and that their statements have been entered into the dossier as evidence. Once established the existence of multiple testimonies, their gravity, and Fr. Buela’s greater accountability in his condition of Spiritual Director, General Superior, plus the fact that he is a Founder, this fully assembled Congregation finds its duty to take appropriate measures for the well being of the Institute of the Incarnate Word. 1. The removal of Father Carlos Buela the office of Superior General of the Institute of the Incarnate Word. 2. The obligation of Fr. Buela to reside, until further notice, far from the Institute in the Abbey La Pierre Qui Vire, under the authority of the Abbot that can regulate Buela’s contacts with members of the Institute of the Incarnate Word. Case hereof the Holy Father has been duly informed and has specifically approved the provisions given here in the audience granted to the Hon. Cardinal Prefect Franc Rodé, CM, dated July 4 and October 1, 2009. Given in Rome on January 22, 2010. Tal función institucional el Dicasterio lo realiza en nombre y por autoridad del Sumo Pontífice (can. 360) el cual ha sido ampliamente y repetidamente informado acerca del caso aquí juntamente tratado y decidido. Cerciorada la existencia de múltiples hechos, su gravedad, aumentada por la calificación de Fundador, Superior General y Director Espiritual de quien los ha cometido y, finalmente la imputabilidad a cargo del P. Buela, el Dicasterio, reunido a tal efecto en Congreso, ha tenido como deber tomar adecuadas medidas para el ben del Instituto del Verbo Encarnado.